I get the urge, when I can see a project is nearly complete, to finish it. Other things that might need doing are set aside. 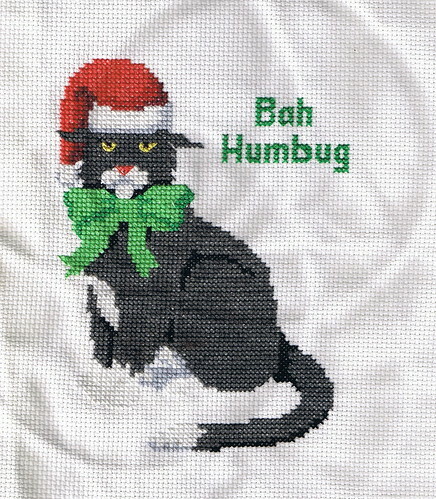 Monday and Tuesday, that was the case with the cat cross-stitch. I got this far on Monday. I could see it wouldn't take much more time to finish. It became almost an obsession to finish it last night. I stayed up a bit late but all that's left is the outlining. 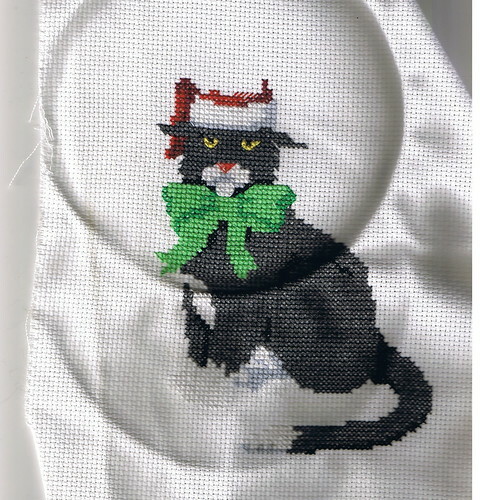 I think I shall turn it into a small wall hanging as I did with the Merry Christmas stitching. I also think I might have all the pieces I need to finish this over the coming weekend without a trip to the store. Searching for the right backing materials will also force me to clean and organize the office closet. I brought home the boxes. They've just not gone anywhere other than under the kitchen table. So, what's next? I'm thinking these dog days of summer are the perfect time to fish a book out of the pile and read it.